Clusters of circulating tumor cells (CTCs) may play a larger role in cancer metastasis than previously thought. Researchers at Massachusetts General Hospital have now shown that these clusters can squeeze through microfluidic channels just 7 microns (μm) in diameter. The team’s findings were published today (April 18) in PNAS. “There’s a common belief in the field that even single CTCs traversing through capillary beds would destroy the majority of them through physical shearing,” Edward Cho of Spectrum Genomics wrote in an email toThe Scientist. This study “demonstrates new evidence that clusters of CTCs may have a mechanism to prevent shearing as they traverse through small capillaries, and thus may have greater metastatic potential than previously thought,” added Cho, who was not involved in the work. To investigate, Toner and his colleagues created 7-μm-wide microfluidic channels designed to mimic the mechanical properties of human capillaries, and filmed clusters of CTCs—derived from patient blood samples and from cell lines—as they moved through the channels. A cluster of four tumor cells elongates and compresses as it travels through a 7-μm microfluidic capillary.PNAS, AU ET AL. Clusters of tumor cells (green) moving through a transgenic zebrafish blood vessel (arrows indicate direction of flow through dorsal aorta, caudal vein, and pivot point)PNAS, AU ET AL. Finally, Toner’s team showed that these CTC clusters could be broken up with certain drugs. The researchers treated clusters with either FAK inhibitor 14, a molecule overproduced by many tumors that inhibits a protein involved in cell-cell adhesion, or the chemotherapy drug paclitaxel, which also weakens cell junctions. When the researchers injected the treated clusters into the microfluidic channels, the clusters broke up into smaller clumps or single CTCs, suggesting a possible avenue for treatment. S.H. Au et al., “Clusters of circulating tumor cells traverse capillary-sized vessels,” PNAS,doi:10.1073/pnas.1524448113, 2016. Metastasis is responsible for 90% of cancer-related deaths and is driven by tumor cells circulating in blood. However, it is believed that only individual tumor cells can reach distant organs because multicellular clusters are too large to pass through narrow capillaries. Here, we collected evidence by examining clusters in microscale devices, computational simulations, and animals, which suggest that this assumption is incorrect, and that clusters may transit through capillaries by unfolding into single-file chains. This previously unidentified cell behavior may explain why previous experiments reported that clusters were more efficient at seeding metastases than equal numbers of single tumor cells, and has led to a strategy that, if applied clinically, may reduce the incidence of metastasis in patients. Multicellular aggregates of circulating tumor cells (CTC clusters) are potent initiators of distant organ metastasis. However, it is currently assumed that CTC clusters are too large to pass through narrow vessels to reach these organs. Here, we present evidence that challenges this assumption through the use of microfluidic devices designed to mimic human capillary constrictions and CTC clusters obtained from patient and cancer cell origins. Over 90% of clusters containing up to 20 cells successfully traversed 5- to 10-μm constrictions even in whole blood. Clusters rapidly and reversibly reorganized into single-file chain-like geometries that substantially reduced their hydrodynamic resistances. Xenotransplantation of human CTC clusters into zebrafish showed similar reorganization and transit through capillary-sized vessels in vivo. Preliminary experiments demonstrated that clusters could be disrupted during transit using drugs that affected cellular interaction energies. These findings suggest that CTC clusters may contribute a greater role to tumor dissemination than previously believed and may point to strategies for combating CTC cluster-initiated metastasis. In the cellular media environment, some of the most pernicious messaging occurs within tumors, which form a kind of echo chamber that amplifies molecular interactions. These interactions, which support the growth and spread of cancer, occur not only between genetically diverse cancer cells, but also between cancer cells and healthy cells. That healthy cells should participate in such distorted discourse is disappointing but undeniable, say scientists based at the Institute of Cancer Research (ICR). These scientists report that stromal cells are all too receptive to KRAS signals secreted by cancer cells. Under the influence of oncogenic KRAS, stromal cells secrete a message of their own, one that cancer cells cannot produce themselves, and the stromal cells’ messaging ends up reinforcing the cancer cells’ malignant behavior. These findings appeared April 14 in the journal Cell, in an article entitled, “Oncogenic KRAS Regulates Tumor Cell Signaling via Stromal Reciprocation.” The article describes how the ICR researchers studied communication networks in cells from a type of pancreatic cancer called pancreatic ductal adenocarcinoma, one of the most deadly forms of cancer. Normal KRAS makes occasional signals that tell a cell to divide; but when the gene is mutated, it becomes hyperactive and helps drive cancer cells’ rapid and uncontrolled growth. KRAS is mutated in more than 90% of pancreatic cancer, and in nearly 20% of all cancers. In other words, by monitoring reciprocal signaling, the ICR scientists discovered that healthy cells were responding with a totally new message, one propagated via IGF1R/AXL-AKT. This message doubled the capacity for KRAS to drive malignant behavior in cancer cells. In Brief – Cell-specific proteome labeling reveals that oncogenic KRAS stimulates stromal cells to initiate reciprocal signaling back to pancreatic tumor cells, thereby enabling signaling capacity beyond the traditionally studied cell-autonomous pathways. 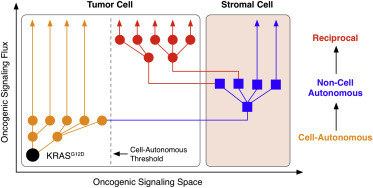 Oncogenic mutations regulate signaling within both tumor cells and adjacent stromal cells. Here, we show that oncogenic KRAS (KRASG12D) also regulates tumor cell signaling via stromal cells. By combining cell-specific proteome labeling with multivariate phosphoproteomics, we analyzed heterocellular KRASG12D signaling in pancreatic ductal adenocarcinoma (PDA) cells. Tumor cell KRASG12D engages heterotypic fibroblasts, which subsequently instigate reciprocal signaling in the tumor cells. Reciprocal signaling employs additional kinases and doubles the number of regulated signaling nodes from cell-autonomous KRASG12D. Consequently, reciprocal KRASG12Dproduces a tumor cell phosphoproteome and total proteome that is distinct from cell-autonomous KRASG12D alone. Reciprocal signaling regulates tumor cell proliferation and apoptosis and increases mitochondrial capacity via an IGF1R/AXL-AKT axis. These results demonstrate that oncogene signaling should be viewed as a heterocellular process and that our existing cell-autonomous perspective underrepresents the extent of oncogene signaling in cancer. Solid cancers are heterocellular systems containing both tumor cells and stromal cells. Coercion of stromal cells by tumor cell oncogenes profoundly impacts cancer biology (Friedl and Alexander, 2011, Quail and Joyce, 2013) and aberrant tumor-stroma signaling regulates many hallmarks of cancer (Hanahan and Weinberg, 2011). 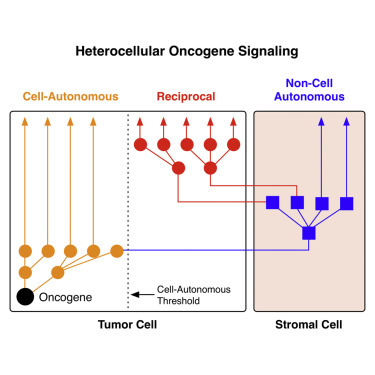 While individual oncogene-driven regulators of tumor-stroma signaling have been identified, the propagation of oncogene-dependent signals throughout a heterocellular system is poorly understood. Consequently, our perspective of oncogenic signaling is biased toward how oncogenes regulate tumor cells in isolation (Kolch et al., 2015). In a heterocellular cancer, tumor cell oncogenes drive aberrant signaling both within tumor cells (cell-autonomous signaling) and adjacent stromal cells (non-cell-autonomous signaling) (Croce, 2008, Egeblad et al., 2010). As different cell types process signals via distinct pathways (Miller-Jensen et al., 2007), heterocellular systems (containing different cell types) theoretically provide increased signal processing capacity over homocellular systems (containing a single cell type). By extension, oncogene-dependent signaling can theoretically engage additional signaling pathways in a heterocellular system when compared to a homocellular system. However, to what extent activated stromal cells reciprocally regulate tumor cells beyond cell-autonomous signaling is not well understood. We hypothesized that the expanded signaling capacity provided by stromal heterocellularity allows oncogenes to establish a differential reciprocal signaling state in tumor cells. To test this hypothesis, we studied oncogenic KRAS (KRASG12D) signaling in pancreatic ductal adenocarcinoma (PDA). KRAS is one of the most frequently activated oncogenic drivers in cancer (Pylayeva-Gupta et al., 2011) and is mutated in >90% of PDA tumor cells (Almoguera et al., 1988). PDA is an extremely heterocellular malignancy—composed of mutated tumor cells, stromal fibroblasts, endothelial cells, and immune cells (Neesse et al., 2011). Crucially, the gross stromal pancreatic stellate cell (PSC) expansion observed in the PDA microenvironment is non-cell-autonomously controlled by tumor cell KRASG12D in vivo (Collins et al., 2012, Ying et al., 2012). As a result, understanding the heterocellular signaling consequences of KRASG12D is essential to comprehend PDA tumor biology. Comprehensive analysis of tumor-stroma signaling requires concurrent measurement of cell-specific phosphorylation events. Recent advances in proteome labeling now permit cell-specific phosphoproteome analysis in heterocellular systems (Gauthier et al., 2013, Tape et al., 2014a). Furthermore, advances in proteomic multiplexing enable deep multivariate phospho-signaling analysis (McAlister et al., 2012, Tape et al., 2014b). Here, we combine cell-specific proteome labeling, multivariate phosphoproteomics, and inducible oncogenic mutations to describe KRASG12Dcell-autonomous, non-cell-autonomous, and reciprocal signaling across a heterocellular system. This study reveals KRASG12D uniquely regulates tumor cells via heterotypic stromal cells. By exploiting heterocellularity, reciprocal signaling enables KRASG12D to engage oncogenic signaling pathways beyond those regulated in a cell-autonomous manner. Expansion of KRASG12D signaling via stromal reciprocation suggests oncogenic communication should be viewed as a heterocellular process. Whether oncogenes regulate tumor cell signaling via stromal cells is a fundamental question in tumor biology. Using heterocellular multivariate phosphoproteomics, we demonstrate how oncogenic KRAS signals through local non-tumor cells to achieve a differential reciprocal signaling state in the inceptive tumor cells. In PDA, this reciprocal axis supplements oncogenic cell-autonomous signaling to control protein abundance, transcription, mitochondrial activity, proliferation, apoptosis, and colony formation. Reciprocal signaling is the exclusive product of heterocellularity and cannot be achieved by tumor cells alone. These observations imply oncogenes expand their capacity to deregulate cellular signaling via stromal heterocellularity (Figure 7). Despite the well-established heterocellularity of cancer, our understanding of oncogenic signaling within tumor cells has largely excluded non-tumor cells. We observe that stromal cells approximately double the number of tumor cell signaling nodes regulated by oncogenic KRAS, suggesting both cell-autonomous (internal) and reciprocal (external) stimuli should be considered when defining aberrant oncogenic signaling states. For example, although KRAS is thought to cell-autonomously regulate AKT in PDA (Eser et al., 2014), we show that KRASG12D activates AKT, not cell-autonomously, but reciprocally. As PI3K signaling is essential for PDA formation in vivo (Baer et al., 2014, Eser et al., 2013, Wu et al., 2014) reciprocal signaling may control oncogene-dependent tumorigenesis. Our findings suggest future genetic studies should consider the heterocellular signaling consequences of oncogene/tumor-suppressor deregulation. The observation that many oncogene-dependent tumor cell signaling nodes require reciprocal activation has important implications for identifying pharmacological inhibitors of oncogene signaling. For example, if PDA tumor cells were screened alone, one would expect MEK, MAPK, and CDK inhibitors to perturb KRASG12D signaling. However, when screened in conjunction with heterotypic stromal cells, our study additionally identified SHH, AKT, and IGF1R/AXL inhibitors as KRASG12D-dependent targets in tumor cells. Inhibitors of signaling specific to reciprocally engaged tumor cells, such as or AKT or IGF1R/AXL, block heterocellular phenotypes (e.g., protein expression, proliferation, mitochondrial performance, and anti-apoptosis), but have little effect on KRASG12D tumor cells alone. An appreciation of reciprocal nodes increases our molecular understanding of drug targets downstream of oncogenic drivers and highlights focal points where reciprocal signals converge (e.g., AKT). These trans-cellular observations reinforce the importance of understanding cancer as a heterocellular disease. Previous work in PDA tumor cells under homocellular conditions demonstrated cell-autonomous KRASG12D shifts metabolism toward the non-oxidative pentose phosphate pathway (Ying et al., 2012), whereas KRASG12D-ablated cells depend on mitochondrial activity (Viale et al., 2014). Here, we show that heterocellular reciprocal signaling can restore the expression of mitochondrial proteins and subsequently re-establish both mitochondrial polarity and superoxide levels. This suggests KRASG12D regulates non-oxidative flux through cell-autonomous signaling and mitochondrial oxidative phosphorylation through reciprocal signaling. These results provide a unique example of context-dependent metabolic control by oncogenes and reinforce the emerging role of tumor-stroma communication in regulating cancer metabolism (Ghesquière et al., 2014). In PDA, the stroma has dichotomous pro-tumor (Kraman et al., 2010, Sherman et al., 2014) and anti-tumor (Lee et al., 2014, Rhim et al., 2014) properties. It is becoming increasingly evident that non-cell-autonomously activated stromal cells vary within a tumor and can influence tumors in a non-obvious manner. For example, while vitamin D receptor normalization of stromal fibroblasts improves PDA therapeutic response (Sherman et al., 2014), total stromal ablation increases malignant behavior (Lee et al., 2014, Rhim et al., 2014). Thus, while stromal purging is unlikely to provide therapeutic benefit in PDA, “stromal reprogramming” toward an anti-tumor stroma is now desirable (Brock et al., 2015). Although we describe a largely pro-tumor reciprocal axis, both pro- and anti-tumor stromal phenotypes likely transduce across reciprocal signaling networks. Our work suggests future efforts to therapeutically reprogram the PDA stroma toward anti-tumor phenotypes will require an understanding of reciprocal signaling. In describing the first oncogenic reciprocal axis, this study provides a foundation to measure the cell-cell communication required for anti-tumor stromal reprogramming. We demonstrate heterocellular multivariate phosphoproteomics can be used to observe reciprocal signaling in vitro. Unfortunately, cell-specific isotopic phosphoproteomics is not currently possible in vivo. To delineate reciprocal signaling in vivo, experimental systems must support manipulation of multiple cell-specific variables and provide cell-specific signaling readouts. Simple pharmacological perturbation of reciprocal nodes (e.g., IGF1R, AXL, AKT, etc.) in existing PDA GEMMs will in principle affect all cell types (e.g., tumor cells, PSCs, immune cells) and cannot provide axis-specific information in vivo. Future in vivo studies of reciprocal signaling will require parallel inducible genetic manipulation (e.g., oncogene activation in cancer cell and/or inhibition of reciprocal node in stromal cell), combined with cell-specific signaling data (e.g., using epithelial tissue mass-cytometry) (Simmons et al., 2015). We describe KRASG12D reciprocal signaling between PDA tumor cells and PSCs. However, it is likely oncogenic reciprocal signaling occurs across multiple different cell types in the tumor microenvironment. For example, in PDA, FAP+stromal fibroblasts secrete SDF1 that binds tumor cells to suppress T cells (Feig et al., 2013). Our model predicts oncogene signaling expands across several cell types in the tumor microenvironment—including immune cells. Moreover, as oncogenes non-cell-autonomously regulate the stroma in many other tumor types (Croce, 2008), our model predicts oncogenic reciprocal signaling to be a broad phenomenon across all heterocellular cancers. The presented heterocellular multivariate phosphoproteomic workflow now enables future characterization of oncogenic reciprocal signaling in alternative cancer types. As differentiated cells process signals in unique ways, heterocellularity provides increased signal processing space over homocellularity. We provide evidence that KRASG12D exploits heterocellularity via reciprocal signaling to expand tumor cell signaling space beyond cell-autonomous pathways. Given the frequent heterocellularity of solid tumors, we suspect reciprocal signaling to be a common—albeit under-studied—axis in oncogene-dependent signal transduction. The past several years have seen some exciting results for cancer immunotherapy. However, there remains a fundamental lack of understanding of immune system recognition in various cancers. Many large-scale sequencing efforts have added to our collective knowledge base, but too many of these studies have been deficient in comprehensive epidemiological and demographic information. Now, researchers at the Dana-Farber Cancer Institute and the Broad Institute of MIT and Harvard report on their findings from a new study, which found that colorectal cancers festooned with tumor-related proteins called neoantigens were likely to be saturated with disease-fighting white blood cells, mainly lymphocytes. Using several data sets from patients in two large health-tracking studies, the Nurses’ Health Study and the Health Professionals Follow-up Study, investigators performed whole-exome sequencing on colorectal tumor samples from 619 patients—itemizing each DNA base that specifies how cell proteins are to be constructed. This information was merged with data from tests of the immune system’s response to the tumors and with patient clinical data, including length of survival. Neoantigens are mutated forms of protein antigens, which are found on normal cells. Genetic mutations often cause cancer cells to produce abnormal proteins, some of which get trafficked to the cell surface, where they serve as a red flag to the immune system that something has gone awry with the cell. Physicians often take advantage of therapies known as immune checkpoint inhibitors, which work by removing some of the barriers to an immune system attack on cancer. Although these agents have produced astonishing results in some cases, they’re effective only in patients whose immune system has already launched an immune response to cancer. This new study may help investigators identify which patients are most likely to benefit in new clinical trials of immune checkpoint inhibitors by showing that tumors with high antigen loads are apt to be laced with T cells—and therefore able to provoke an immune response. Interestingly, this new analysis found several often-mutated genes that had not previously been strongly associated with the disease, including BCL9L, RBM10, CTCF, and KLF5, suggesting that they may be valuable targets for new therapies. Somatic missense mutations can initiate tumorogenesis and, conversely, anti-tumor cytotoxic T cell (CTL) responses. Tumor genome analysis has revealed extreme heterogeneity among tumor missense mutation profiles, but their relevance to tumor immunology and patient outcomes has awaited comprehensive evaluation. Here, for 515 patients from six tumor sites, we used RNA-seq data from The Cancer Genome Atlas to identify mutations that are predicted to be immunogenic in that they yielded mutational epitopes presented by the MHC proteins encoded by each patient’s autologous HLA-A alleles. Mutational epitopes were associated with increased patient survival. Moreover, the corresponding tumors had higher CTL content, inferred from CD8A gene expression, and elevated expression of the CTL exhaustion markers PDCD1 and CTLA4. Mutational epitopes were very scarce in tumors without evidence of CTL infiltration. These findings suggest that the abundance of predicted immunogenic mutations may be useful for identifying patients likely to benefit from checkpoint blockade and related immunotherapies. The accumulation of somatic mutations underlies the initiation and progression of most cancers by conferring upon tumor cells unrestricted proliferative capacity (Hanahan and Weinberg 2011). The analysis of cancer genomes has revealed that tumor mutational landscapes (Vogelstein et al. 2013) are extremely variable among patients, among different tumors from the same patient, and even among the different regions of a single tumor (Gerlinger et al. 2012). There is a need for personalized strategies for cancer therapy that are compatible with mutational heterogeneity, and in this regard, immune interventions that aim to initiate or enhance anti-tumor immune responses hold much promise. Therapeutic antibodies and chimeric antigen receptor (CAR) technologies have shown anti-cancer efficacy (Fox et al. 2011), but such antibody-based approaches are limited to cell surface target antigens (Slamon et al. 2001; Coiffier et al. 2002; Yang et al. 2003;Cunningham et al. 2004; Kalos et al. 2011). In contrast, most tumor mutations are point mutations in genes encoding intracellular proteins. Short peptide fragments of these proteins, after intracellular processing and presentation at the cell surface as MHC ligands, can elicit T cell immunoreactivity. Further, the presence of tumor infiltrating lymphocytes (TIL), in particular, CD8+ T cells, has been associated with increased survival (Sato et al. 2005; Nelson 2008; Oble et al. 2009; Yamada et al. 2010; Gooden et al. 2011; Hwang et al. 2012), suggesting that the adaptive immune system can mount protective anti-tumor responses in many cancer patients (Kim et al. 2007; Fox et al. 2011). The antigen specificities of tumor-infiltrating T cells remain almost completely undefined (Andersen et al. 2012), but there are numerous examples of cytotoxic T cells recognizing single amino acid coding changes originating from somatic tumor mutations (Lennerz et al. 2005;Matsushita et al. 2012; Heemskerk et al. 2013; Lu et al. 2013; Robbins et al. 2013;van Rooij et al. 2013; Wick et al. 2014). Thus, the notion that tumor mutations are reservoirs of exploitable neo-antigens remains compelling (Heemskerk et al. 2013). For a mutation to be recognized by CD8+ T cells, the mutant peptide must be presented by MHC I molecules on the surface of the tumor cell. The ability of a peptide to bind a given MHC I molecule with sufficient affinity for the peptide-MHC complex to be stabilized at the cell surface is the single most limiting step in antigen presentation and T cell activation (Yewdell and Bennink 1999). Recently, several algorithms have been developed that can predict which peptides will bind to given MHC molecules (Nielsen et al. 2003; Bui et al. 2005; Peters and Sette 2005; Vita et al. 2010; Lundegaard et al. 2011), thereby providing guidance into which mutations are immunogenic. The Cancer Genome Atlas (TCGA) (http://cancergenome.nih.gov/) is an initiative of the National Institutes of Health that has created a comprehensive catalog of somatic tumor mutations identified using deep sequencing. As a member of The Cancer Genome Atlas Research Network, our center has generated extensive tumor RNA-seq data. Here, we have used public TCGA RNA-seq data to explore the T cell immunoreactivity of somatic missense mutations across six tumor sites. This type of analysis is challenged not only by large numbers of mutations unique to individual patients, but also by the complexity of personalized antigen presentation by MHC arising from the extreme HLA allelic diversity in the outbred human population. Previous studies have explored the potential immunogenicity of tumor mutations (Segal et al. 2008; Warren and Holt 2010; Khalili et al. 2012), but these have been hampered by small sample size and the inability to specify autologous HLA restriction. Recently, we described a method of HLA calling from RNA-seq data that shows high sensitivity and specificity (Warren et al. 2012). Here, we have obtained matched tumor mutational profiles and HLA-A genotypes from TCGA subjects and used these data to predict patient-specific mutational epitope profiles. The evaluation of these data together with RNA-seq-derived markers of T cell infiltration and overall patient survival provides the first comprehensive view of the landscape of potentially immunogenic mutations in solid tumors. ….. The results of the present study have clinical implications. We have shown that patients with tumors bearing missense mutations predicted to be immunogenic have a survival advantage (Fig. 3D). These tumors also show evidence of higher CD8+ TIL, which suggests that a number of these mutations might be immunoreactive. The existence of these mutations is encouraging because, in principle, they could be leveraged by personalized therapeutic vaccination strategies or adoptive transfer protocols to enhance anti-tumor immunoreactivity. Likewise, patients with tumors showing naturally immunogenic mutations and associated TIL are potential candidates for treatment with immune modulators such as CTLA4- or PDCD1-targeted antibodies. There is evidence that such therapies are most effective against tumors infiltrated by T cells (Moschos et al. 2006; Hamid et al. 2009). Our results indicate that tumors bearing predicted immunogenic mutations have not only elevated CD8A expression (Fig. 3C) but also elevated expression of CTLA4 and PDCD1 (Fig. 4), reinforcing the notion that these patients may be optimal candidates for immune modulation. Importantly, we observed that tumors with low levels of CD8+ TIL invariably have far fewer immunogenic mutations. Such patients would be better suited to conventional therapy or to immunotherapies (e.g., chimeric antigen receptor modified T cells) that target nonmutated antigens. http://www.ncbi.nlm.nih.gov/pmc/articles/PMC3229261/ Apr 12, 2011 … Keywords: tumor immune infiltrate, T-cells, cancer prognosis, colon … By conducting genomic and in situ immunostaining on resected tumors from ….. of tumor-infiltrating immune cells correlates with better overall survival. Data from molecular profiles of tumors and tumor associated cells provide a model in which cancer cells can acquire the capability of avoiding immune surveillance by expressing an immune-like phenotype. Recent works reveal that expression of immune antigens (PDL1, CD47, CD73, CD14, CD68, MAC387, CD163, DAP12, and CD15) by tumor cells “immune resistance,” combined with prometastatic function of nonmalignant infiltrating cells, may represent a strategy to overcome the rate-limiting steps of metastatic cascade through (a) enhanced interactions with protumorigenic myeloid cells and escape from T-dependent immune response mediated by CD8+ and natural killer (NK) cells; (b) production of immune mediators that establish a local and systemic tumor-supportive environment (premetastatic niche); (c) ability to survive either in the peripheral blood as circulating tumor cells (CTCs) or at the metastatic site forming a cooperative prometastatic loop with foreign “myeloid” cells, macrophages, and neutrophils, respectively. The development of cancer-specific “immune resistance” can be orchestrated either by cooperation with tumor microenvironment or by successive rounds of genetic/epigenetic changes. Recognition of the applicability of this model may provide effective therapeutic avenues for complete elimination of immune-resistant metastatic cells and for enhanced antitumor immunity as part of a combinatorial strategy. Metastasis remains the most significant cause of cancer-associated morbidity and mortality and specific targeting molecules have had limited success in reversing metastatic progression in the clinical setting [1–3]. Understanding the exact molecular and cellular basis of the events that facilitate cancer metastasis has been difficult so far. Over the past years, a well-accepted theory suggests that genomic alterations of the malignant cells accompanied by the so-called tumor microenvironment “nonmalignant cells” contribute to the metastatic cascade [4, 5]. As such, metastasis is frequently described as the sequential execution of multiple steps. To establish the metastatic tumor, cancer cells have to acquire the traits that enable them to efficiently cooperate with the host stroma and simultaneously avoid antitumor immune response [4–9]. At early stage of carcinogenesis, tumors appear to be vulnerable because mutant and thus potentially immunogenic tumor cells are being exposed to the immune system, which can recognize them and restrict their growth [10, 11]. This is the case of tumor-infiltrating immune cells particularly CD8+ T cells and NK cells which have the potential to restrict the tumor outgrowth or reject metastatic tumor cells [12, 13]. According to this notion, in most primary tumors, a strong Th1/cytotoxic T cells infiltration correlates with a longer patient’s survival [12–14]. Unfortunately, tumor develops multiple mechanisms of evading immune responses, by forming a compromised microenvironment that allows the dissemination of malignant cells in a foreign microenvironment through molecular mechanisms still poorly characterized. A variety of stromal cells, particularly M2-phenotype macrophages and myeloid-derived suppressor cells (MDSCs), are recruited to primary tumors; these not only enhance growth of the primary cancer but also facilitate its metastatic dissemination to distant organs [13, 14]. Notably, cooperative “dialogue” between malignant cells and their microenvironment will go on in the systemic circulation and subsequently in the future metastatic site [13–17]. In fact, recent studies have demonstrated that a high systemic inflammatory response, that is, blood neutrophil-lymphocyte ratio (NLR), predicts lower overall survival, higher tumor stage, and a greater incidence of metastasis in multiple tumor types [18, 19]. Therefore, a substantial amount of data suggests a novel dimension of the tumor biology and offers the opportunity to revisit the mechanisms describing evasion of cancer immunosurveillance during the metastatic process. The present review analyses recent studies that elucidate and reinforce the theory by which immune-phenotypic features or “immune resistance” by cancer cells may need to sustain the metastatic cascade and avoid antitumor immune response. A decade of studies has emphasized the nature of cancer as a systemic disease remarking a key role of host microenvironment as a critical hallmark. As a result, a new picture of cancer is emerging in particular due to unexpected cross-talk between malignant cells and the immune system [3–5]. Recent data have expanded the mechanisms of cancer-immune system interactions revealing that every known innate and adaptive immune effector component participates in tumor recognition and control [9, 10]. It is now recognized that in different individuals and with different cancers, at early stage of tumorigenesis, the few cancer cells are detected by NK cells through their encounter with specific ligands on tumor cells . In turn, activation of macrophages and dendritic cells and particularly T and B cells expands production of additional cytokines and further promotes activation of tumor-specific T cells “CD8+ cytotoxic T cells” leading to the generation of immune memory to specific tumor components [14–16]. However, in cases where the immune system is not able to eliminate the cancer, a state of equilibrium develops or eventually cancer cells can resist, avoid, or suppress the antitumor immune response, leading to the immune escape and a fully developed tumor (Figure 1) [9–15]. For example, investigations into the nature of cancer as a genetic disease have suggested two paradigmatic subtypes of colorectal cancer (CRC): chromosomal instability (CIN) and microsatellite instability (MSI), in which the expression of immune-checkpoint proteins can be differentially dysregulated to unleash the potential of the antitumor immune response . In particular, tumors with mismatch-repair deficiency (dMMR) (10–20%) of advanced colorectal cancer tend to have 10 to 100 times more somatic mutations and higher amount of lymphocyte infiltrates than mismatch-repair-proficient colorectal cancers (pMMR), a finding consistent with a stronger antitumor immune response (Figure 1) [11, 20]. According to this notion, recent studies suggest that certain cancer subtypes dMMR CRC with high numbers of somatic mutations are more responsive to PD-1 blockade, a well-known immune-checkpoint inhibitor . In particular, CD8-positive lymphoid infiltrate and membranous PDL1 expression on either tumor cells or tumor-infiltrating lymphocytes at the invasive fronts of the tumor are associated with an improved response to anti-PD-1 therapy in patients with mismatch-repair-deficient cancer [11, 20]. In addition, cancer subtypes with stronger antitumor immune responses (immunogenic) are characterized by surface-exposed calreticulin or heat shock protein 90 (HSP90), which serve as a powerful mobilizing signal to the immune system in the context of damage-associated molecular patterns (DAMPs) . As danger signals, DAMPs accompanied by subversion MHC Class I and II antigens on the plasma membrane of cancer cells appear to be characteristic of stressed or injured cells and can act as adjuvant signals to enhance antitumor immunity mediated by the innate immune system . As described in this review, unfortunately, the large majority of human tumors can suppress the immune system to enhance their survival, rendering them invisible to cytotoxic T lymphocytes through a variety of mechanisms. Furthermore, in most cases, tumor-infiltrating immune cells differentiate into cells that promote each step of the tumor progression supporting ability of cancer cells to invade and survive in foreign organs. In addition, the intricate network of malignant and immune components represents a prominent obstacle to the effects of therapeutic agents. A genomic analysis of heterogeneous colorectal tumor samples has uncovered interactions between immunophenotype and various aspects of tumor biology, with implications for informing the choice of immunotherapies for specific patients and guiding the design of personalized neoantigen-based vaccines. Immunotherapy is a promising new approach for treating human malignancies. Approximately 20% of melanoma and lung cancer patients receiving immune checkpoint inhibitors show responses [1,2]. Current major challenges include identification of patients most likely to respond to specific therapies and elucidation of novel targets to treat those who do not. To address these problems, a detailed understanding of the dynamic interactions between tumors and the immune system is required. In a new study, Zlatko Trajanoski and colleagues  describe a powerful approach to dissecting these issues through high-resolution analysis of patient genomic data. This study represents a significant advance over previous work from this group, which defined 28 immune-cell-type gene expression signatures and identified specific cell types as prognostic indicators in colorectal cancer (CRC) patients . Here, the authors  integrate genomic analyses of CRC tumor molecular phenotypes, predicted antigenicity (called the ‘antigenome’), and immune-cell infiltration derived from multiple independent cohorts to gain refined insights into tumor-immune system interactions. Past studies have used immune-staining techniques to determine associations between a limited set of infiltrating immune cells and patient survival  or tumor molecular phenotype . Here, the authors  use gene set enrichment analysis (GSEA) of immune cell expression signatures to ascertain associations of 28 immune-cell populations with patient survival and tumor molecular phenotypes. Effector memory CD8+ and CD4+ T cells, natural killer cells, and activated dendritic cells are significantly associated with improved overall survival. Interestingly, although the authors’ previous work found no significant prognostic value of regulatory T cells (Tregs) or myeloid-derived suppressor cells (MDSCs) , negative associations of these cell types with overall survival are among the strongest relationships observed in the current study. It is possible that variations in sample collection and preparation may have contributed to this discrepancy. The conclusions, supported by the numerous animal studies demonstrating the importance of cell-mediated immunosuppression, are substantially strengthened by a much larger cohort size used in this study. Another important observation is the association of specific immune cell subsets with CRC tumor stage and molecular phenotypes as classified by mutation rate, microsatellite instability, and methylation status. This knowledge will be crucial in determining which types of immunotherapy are most likely to benefit individual patients. Interestingly, although hypermutated microsatellite-unstable tumors show strong enrichment of adaptive immune cells, similar enrichment is notably lacking in the small population of hypermutated microsatellite-stable tumors. This raises an intriguing question of whether and how microsatellite instability/mismatch repair may independently shape immune responses. Furthermore, Trajanoski and colleagues  find that tumor-infiltrating lymphocytes transition from an adaptive to an innate immunophenotype with increasing tumor stage. This raises an interesting issue of whether immunotherapies that depend on the adaptive immune response can be effective in later stage CRC tumors. In addition to characterizing immune components involved in tumor immune responses, it is equally important to identify and understand the tumor-associated antigens that elicit these responses, called the ‘antigenome’. The authors  analyze RNA-seq and genomic data to identify two types of tumor antigens in CRC – non-mutated cancer germline antigens that are aberrantly overexpressed, and neoantigens, which are generated from non-synonymous somatic mutations. Importantly, the authors  find that cancer-germline antigens are highly shared among patients and are independent of molecular and immune phenotype. In contrast, neoantigens are enriched in the hypermutated microsatellite-unstable phenotype tumors and rarely shared among patients. These results imply a heightened importance of neoantigens in comparison to cancer-germline antigens . In addition, similar analytical methods have recently been applied to identify functional neoantigens in human melanoma and cholangiocarcinoma [8–10]. An emerging theme of these studies is that the in vitro validation rate for predicted neoantigens is relatively low; however, it is unclear whether this is due to limited sensitivity of functional assays or epigenetic silencing to circumvent immunoediting, or whether the number of immunogenic neoantigens is in fact small. Interestingly, Trajanoski and colleagues  find a modest yet significant decrease in neoantigen frequency with increasing tumor stage. Considering the concomitant decrease in adaptive immune cell infiltration, it is tempting to speculate that this phenomenon reflects immunoediting of critical neoepitopes during tumor progression. Furthermore, the authors find an association, albeit not statistically significant, between increased neoantigen burden and improved patient survival. This finding complements a recent report  showing that whereas neoantigen burden roughly predicts survival of anti-CTLA-4-treated melanoma patients, a collection of consensus neoepitope motifs is strongly associated with patient survival. It will be interesting to see if future studies can determine the effect of CRC neoantigen burden in the setting of immunotherapy, and answer the questions of whether an analogous signature of prognostic neoepitope motifs exists for CRC, and whether there are any similarities between substring signatures of different tumor types. For most malignant tumors, morbidity and mortality are, to a great extent, the result of metastatic dissemination, as opposed to the presence of the primary tumor. The existence of circulating tumor cells, which can be shed into the circulation by primary or metastatic malignancies, was first recognized almost 150 years ago, and their diagnostic and therapeutic values have been increasingly appreciated during the last few decades. One of the unique characteristics of circulating tumor cells is that they are in a fundamentally different environment from that established in either the primary tumor or the metastatic one. Although circulating tumor cells can be kept in place so that they can be assessed, the usual technique—immobilization to a solid surface—tends to yield distorted results. Free-floating cells are molecularly and functionally distinct from immobilized cells. For example, nonadhering breast cancer cells were shown to have tubulin-based microtentacles that shape their dynamic behavior, including their aggregation, retention in organs, or interaction with the endothelium. Characterizing circulating tumor cells, then, seems to amount to capturing the substance of freedom, a task that sounds self-defeatingly paradoxical—or at least fraught with difficulties. Overcoming difficulties, however, would likely be worth the effort. Two areas that immediately benefit from the characterization of circulating tumor cells are diagnostics and therapeutics. To address the existing gap in characterizing the biology of free-floating cancer cells, Dr. Jewell and collaborators in the University of Maryland laboratory of physiologist Stuart Martin, Ph.D., have designed an unusual microfluidic device. It can spatially immobilize free-floating tumor cells while maintaining their free-floating characteristics. In this microfluidic device, polyelectrolyte multilayers inhibit the attachment of cells to multiwall plates, allowing their free-floating functional and morphological characteristics to be visualized and studied. Lipid tethers incorporated into the device interact with the cell membrane and allow cells to remain loosely attached and spatially localized, offering the possibility to perform applications such as real-time imaging and drug screening. Surface tethering of circulating tumor cells also provides the opportunity to capture arrays of tumor cells; to introduce a perturbation such as a drug or a change in flow rate or mechanical properties; and then to collect the same individual cells that had already been imaged. In these cells, morphological changes can be correlated with genomic or proteomic information, providing an opportunity to dynamically understand how the mechanochemical properties of the cells change in response to external perturbations. At the University of California, Los Angeles, Dino Di Carlo, Ph.D., and colleagues have developed High-Throughput Vortex Chip (Vortex-HT) technology, which uses parallel microfluidic vortex chambers to accumulate the larger circulating tumor cells from flowing blood. Vortex-HT reportedly generates less contamination with white blood cells than other technologies and isolates cells in a smaller output volume. Early techniques to capture circulating tumor cells have taken advantage of cell size differences, leading to the development of filtration-based approaches. This was followed, more recently, by the emergence of inertial microfluidic-based approaches, of which vortex technology is one example. Dr. Di Carlo and colleagues recently developed the High-Throughput Vortex Chip (Vortex HT), an improved microfluidic technology that allows the label-free, size-based enrichment and concentration of rare cells. The strategy involves minimal pretreatment steps, reducing cell damage, and allows an approximately 8 mL vial of blood to be processed within 15–20 minutes. Circulating tumor cells can then be used for subsequent steps, such as real-time imaging or immunostaining. The capture efficiency, up to 83%, is slightly lower than with Dean flow fractionation and CTC-iChip, but Vortex HT generates much less contamination with white blood cells than other technologies and isolates cells in a smaller output volume. Along with circulating tumor cells, another promising noninvasive biomarker is provided by circulating tumor DNA. Such DNA can be detected in the plasma or serum of many cancer patients as a result of the active or passive release of nucleic acid from apoptotic or necrotic tumor cells. While circulating tumor DNA can be used to dynamically collect information about specific mutations, and provides advantages for some applications, it is not powered to offer certain types of information that can be captured only from circulating tumor cells. For example, it cannot provide details about cellular morphology or protein expression and localization. Also, it cannot enable investigators to perform proteomic profiling in parallel with genomic profiling. These are not the only situations in which circulating DNA serves as a poor substitute for circulating tumor cells. “Another example,” notes Dr. Di Carlo, occurs with “applications that involve a drug screen that seeks to determine whether cells are sensitive or resistant to a particular compound.” Additionally, for certain cancers that have no dominant mutations, or for which mutations are not well known, circulating tumor DNA cannot provide the information that can be interrogated from profiling circulating tumor cells. In a recent study using the CTC-iChip technology, Dr. Miyamoto and colleagues performed single-cell RNA sequencing. The investigators used 77 circulating tumor cells isolated by microfluidic enrichment from 13 patients. “The goal of this work was to use the circulating tumor cell technology to identify potential resistance mechanisms in metastatic castration-resistant prostate cancer,” explains Dr. Miyamoto. In patients who were undergoing therapy with an androgen receptor inhibitor, the retrospective analysis of their circulating tumor cells revealed that the noncanonical Wnt signaling pathway may play a role in resistance to therapy. Morphotek, a biopharmaceutical company that specializes in the development of protein and antibody products through the use of gene-evolution technology, has developed the ApoStream device, which uses continuous field-flow-assist and dielectrophoresis technology to isolate and recover circulating tumor cells from the blood of cancer patients. In a recent study in Biomarker Insights, Morphotek scientists described how they interrogated ApoStream-isolated circulating tumor cells by employing laser-scanning cytometry using highly selective antibodies. The scientists detected folate receptor alpha (FRα) expression in CK+/CD45– cells isolated from lung cancer, as indicated in these representative images. Many studies correlated the presence of circulating tumor cells with prognosis in several cancers, including breast, lung, and colorectal malignancies. However, one of the challenges associated with analyzing circulating tumor cells is that not every cancer releases them into the circulation. Also, even among cancers that do, not every cancer generates a lot of these cells. For example, as estimated using current techniques, ovarian cancers do not appear to shed as many circulating tumor cells as several other malignancies. “Another challenge is that existing technologies are often limited by sensitivity much more than by specificity,” cautions Dr. O’Shannessy. This limitation has the potential to make interpatient comparisons, and even the longitudinal follow-up of patients, particularly difficult. Previously, investigators at Morphotek described ApoStream®, a device that uses continuous field-flow-assist and dielectrophoresis technology to isolate and recover circulating tumor cells from the blood of cancer patients. In a recent study, Dr. O’Shannessy and colleagues used laser-scanning cytometry and highly selective antibodies to identify folate receptor alpha-positive cells from circulating tumor cells that had been isolated using the ApoStream technology. This proof-of-principle study was able to detect folate receptor alpha-positive cells in patients with breast cancer, ovarian cancer, and non-small cell lung adenocarcinoma, but not in patients with squamous cell lung cancer. These findings supporting previous findings that were made using the respective primary or metastatic tumors. The study demonstrated the utility of following the enrichment and identification of circulating tumor cells with immunofluorescence staining for a specific tumor marker. This combination of approaches emerges as a valuable noninvasive strategy for differentiating among tumor types. It can also be used to examine heterogeneous cell populations within tumors, particularly when tissue samples are not available. Recently, Dr. Kelley and colleagues described a new molecular approach based on a fluidic chip that captures circulating tumor cells using two-dimensional sorting. At a first stage, DNA aptamers specific to cell-surface markers bound to magnetic nanoparticles are used to capture circulating tumor cells. Subsequently, at a second stage, the corresponding antisense oligonucleotides are used to release the cells, enabling two-dimensional cell sorting. In a proof-of-concept experiment, Dr. Kelley and colleagues illustrated the strength of this approach in isolating cellular subpopulations that exhibit different phenotypes. Also, the investigators validated their results using an invasion assay.